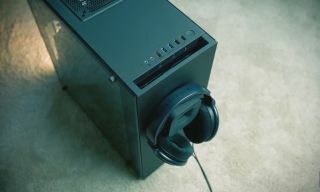 One of the highlights of NZXT's S340 Elite chassis is that it comes with a magnetic "Puck," a square shaped accessory that attaches to the side of the case and is intended to make storing VR or audio headsets easy. It also has a center groove for wrapping long wires and can be split in half "to organize even more rogue cables" at the same time. Well, NZXT had an epiphany that it could sell its Puck as a standalone accessory, and that is exactly what it is planning to do. NZXT put out a cheeky press release announcing its plans, which include offering the Puck in a few different color options: black, white, red, blue, and "NZXT purple." "My headset was just lying on my desk with its cables dangling, haphazardly everywhere and sometimes trapped in the wheel of my desk chair," says Johnny Hou, NZXT’s founder and CEO. "This strange Puck showed up one night in a bright hue and magically all my headset cable management issues were solved!" I've spent some hands on time with the Puck and while it will not "magically" solve all your cable management woes, it's a handy accessory for the most part. It's works really well for dangling audio headsets or wrapping long cables around, though the the problem with storing a VR headset is that it hangs upside down. That means the optics are exposed to dust that can settle inside the headset. It's not a huge deal if you don't have a big dust problem, and even less so with a can of compressed air kept nearby, but it's worth pointing out. The Puck is made of silicone and magnets. It feels sturdy, measuring 85mm x 85mm x 40mm (LxWxD) and weighing 147g. NZXT says it can hold up to 2kg. Look for the Puck to be available sometime next month for around $20 (€20).